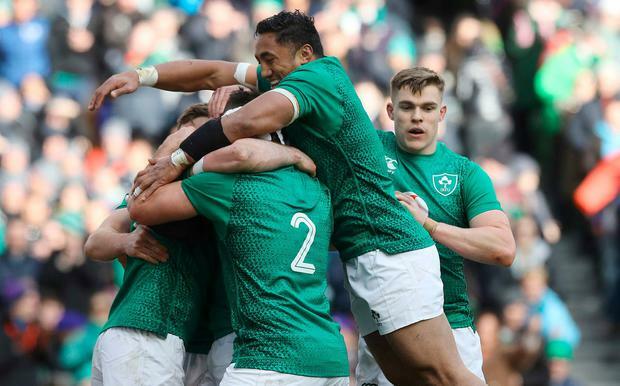 Ireland's Johnny Sexton (obscured) celebrates with team-mates after scoring a try during the Guinness Six Nations match at the Aviva Stadium, Dublin. Ireland gave France the kind of beating they used to give us when I was a boy. French rugby was a cut above back then. We are where they were. Ireland are very much back in form. In the end, we were not terribly upset when they scored. Their loyal supporters sang and cheered, even when France were reeling and confused. There was a large group of French fans eating a feed of chips in Ballsbridge, al fresco. It was warm when they left for Ireland. Vivaldi's 'Four Seasons' is played by symphony orchestras all over France. It's as near they get to our dented weather. We had four seasons in the one day. The snow came in flurries and it is a credit to Ireland there were so few knock- ons. France, the team, suffered from the cold. They're mad for grub out of chip vans. One of the French men was eating a jumbo sausage, the size of a Garda baton. There was general agreement that while the French were better at rugby, the Italians make the better chips. French Fries were invented by, yes, you guessed it, the French. But so much has changed. French rugby is in terrible trouble and if the Italians stole their chips, we stole their rugby with a display of skill, hard work, brains and aggression. We were awake to the breaks. The energy would boil a million kettles if the players were attached to the National Grid. Ireland were wired. There was fusion between backs and forwards. Ireland were first to every battle. But those in the elite corporate sections of the mid-stand cummerbund were first to the jelly and ice cream. There was only about ten per cent seat occupancy in the elite seats when the teams came out. The big sponsors have been very good to Ireland, but they have a moral obligation to get their guests out in time for the arrival of the teams onto the field. The IRFU had warning signs posted up on the TVs hanging off the walls inside the stands. "Ireland will enter the field in 13 minutes and 23 seconds" went the countdown. It made no difference. There was an even longer-than-usual drum beat. It made no difference. 'Allez Les Bleus' was the dominant chant when the players who give so much ran onto the field. It was embarrassing. Again. The Aviva was full for the anthems, though. Sexton and Murray stood together, arm in arm. They had been criticised unfairly. Neither player was fully fit for the opening games, and the ball was coming a second too slow. Murray ran on his toes - a sure sign of well-being. The friends are immutable, brave and smart. For a good many years, the French brought a cockerel to the games. The red and auburn cockerel was thrown over the crossbar by way of bringing good luck to the French. The cockerel may not have felt lucky, though, as the red birds are notoriously bad fliers. I'm not sure whether it was animal rights or Ryanair's strict and expensive baggage policies that ended the custom. But the old ways die hard and today The French should have been sanctioned by The Irish Society for Cruelty to Out-halves. Sexton was punched on the ground, off the ball, and the ref chose to ignore pleas for a review. This is coming from me. I have not spoken to Jonathan about the late tackles and the awful refereeing. We hear so much about player welfare, but then tackles that are only "marginally" late are let go because the tacklers were "committed." These tackles are cowardly as the passer is wide open when he releases the ball. There was a national debate about the kicking of a water bottle and the throwing out of a rebuke of swear words. The Irish players are well able for him. Jonathan drives them, but he is harder on himself than anyone. The bottle-kicking was for their own good. Meanwhile, his kicking of a defenceless Italian water bottle has been referred to the Roma DPP by the Tut-Tuts. Not one late tackle has been punished by suspension. Hopefully the water bottle will make a full recovery. Sexton has bottle. His try and general play was of the highest calibre. The Irish forwards were all over France. Remember, only two of the pack that broke the All Blacks started against Italy. James Ryan benefited from the break. He was everywhere and anywhere, and at times, he was in both at the same time. Rory Best, who was off the pace against England, was a new man. CJ was renewed and recharged. Jack Conan replaced Josh van der Flier, who was having a fine game. Conan showed he can play 6/7 as well as 8. His carries were magnificent. Not one ball did he drop. Sorry about this Jack, but you were Conan the Ball Bearing. Keith Earls was here and Keith Earls was there. He left the left wing for the right like some Tory politician who had a Brexit epiphany. Keith was bi-wingual for his try. That's two corny lines in a row. No more. Promise. There's a giddiness, though, in Dublin tonight and, yes, relief, too. Our boys are back in top form. Like we said here lately, there was no need to panic and there was no panic. It was only a matter of time. There's a sadness there, too. It was Joe's last Six Nations game in Dublin. We owe that man so much. Joe figured us out and then he brought the best out of us.